Where is my VMware Workstation license key stored? How to recover or find a lost VMware product key? Before you can install VMware Workstation you’ll need to find the license key that came with the software. If you’ve lost your license key, there is a way to find it as long as VMware Workstation is still installed. 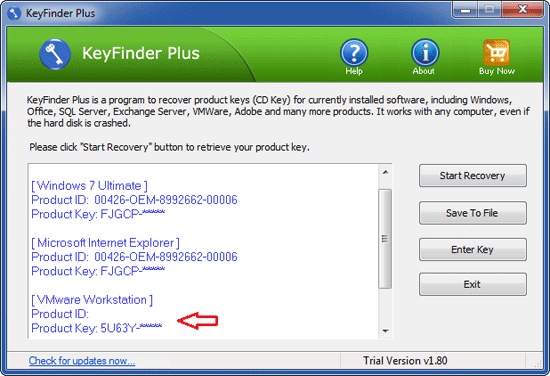 With KeyFinder Plus you can find lost license key (product key) for all versions of VMware Workstation, including VMware Workstation 6, 7, 8, 9 and 10. Here is how can you recover VMware product key in just a few simple steps. How to Find VMware License / Product Key? Download the KeyFinder Plus application on your local computer, and then install it. Start the KeyFinder Plus program. Click on Start Recovery button and then select From current system from the pop-up menu. It will automatically search your computer’s registry for your VMware Workstation license key and for product keys and serial numbers for your other software programs. 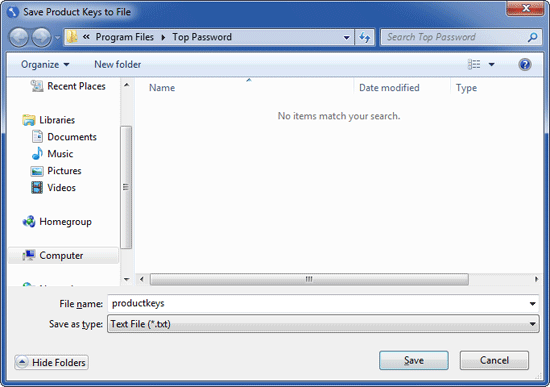 Once the product keys are recovered, click on Save To File button and you’ll get a save file dialog box, which allows you to export the product keys to a text file. Important: You may have come across VMware Workstation keygen programs or other kinds of VMware Workstation cracks but keep in mind that these are not legal ways of obtaining license keys or product keys. It’s legal to use the KeyFinder Plus program to extract the license key from a registered copy of your installed VMware Workstation.